Such tired. Many sleepy. My room was still not available for another two hours so lunch seemed like the only sensible choice to pass the time before a collapsing sleep. 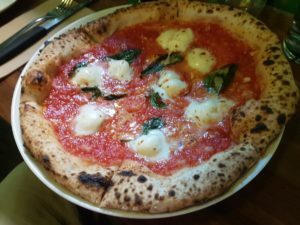 I did some Googling as I had a hankering for pizza and wanted one that was good. SPQR appeared at the top of some judges’ lists and was but a mid-length stroll away. I was their first customer at two minutes after they opened. I was keen to eat. Their menu of pizzas along with some light starters was helpfully detailed on their main chalkboard. I got as far as margherita and stopped. I added a glass of their tap beer, a pretty decent craft lager. The pizza was prepped and cooked to order in their wood-fired oven. It was soon with me looking pretty smart. It proved a highly enjoyable eat. The dough was light with a good crispness which resolved into fluffily chewable. The topping was of excellent quality with the tomato sauce particularly good. 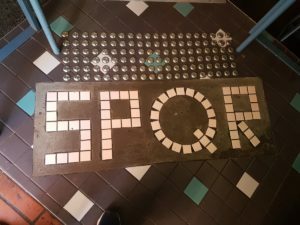 So overall, SPQR served me just the pizza I was looking for. Its pillowy crust was a joyful prelude to the slumber pillow my head hit an hour or so later. I suspect I’ll be back before my time in Melbourne is out as my hankering for pizza is more regular than monthly.